Killerton House. 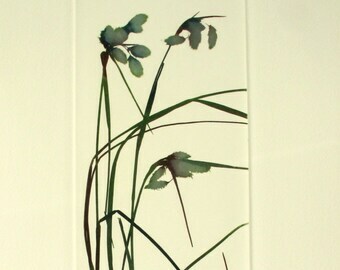 Unique photo etching with mono print wild flowers. Ladybug print. 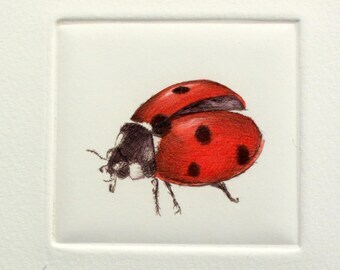 Seven Spot Ladybird hand tinted drypoint print. Nettles for Butterflies. 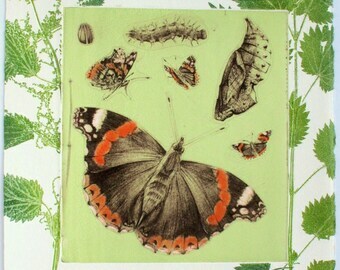 Red Admiral Etching. Announcement Eco minded printmaker. Inspired by bugs, hedgerows and reclaimed landfill sites. I make my printmaking as environmentally friendly as I can and it is STILL magic!! 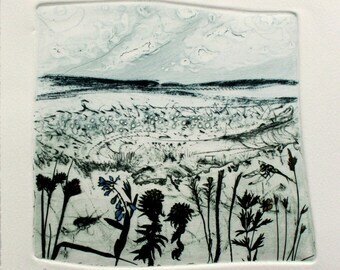 Etching, Drypoint, collagraph, screenprint, mono print and monotype, lino cut and wood engraving. ALL hand crafted originals. There are no reproductions here and only the best quality materials used. Member of the Devon Guild of Craftsmen. Co founder of Double Elephant Print Workshop, Exeter, England. 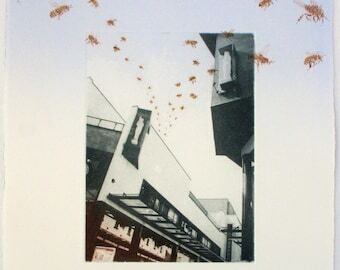 Have a look in the “About” section to find more about me and my printmaking experience. Please read my shop policies before making a purchase – international shipping is available. Nothing makes me happier than when my artwork takes wing and finds new homes! Eco minded printmaker. Inspired by bugs, hedgerows and reclaimed landfill sites. 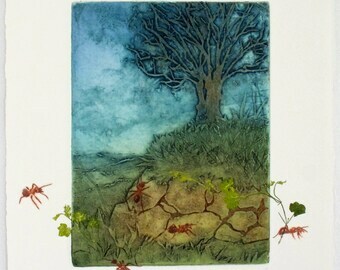 I make my printmaking as environmentally friendly as I can and it is STILL magic!! Dartmoor hedge-bank tree with red wood ants. Collagraph mono print. 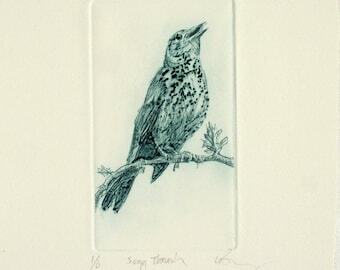 Bird print drypoint. Fine art Song Thrush. Hand pulled print. Collograph mono print. 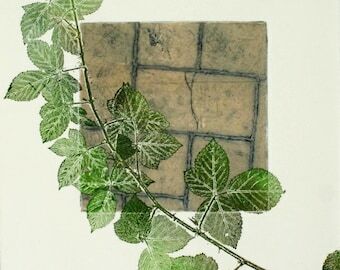 Botanical nature, paving stones and bramble. OOAK. 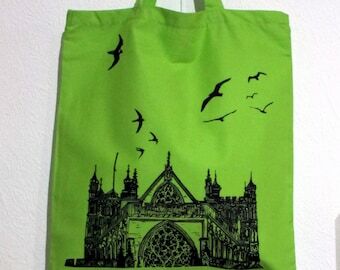 Green tote bag with Exeter Cathedral and birds. Hand printed screenprint. Reusable Shopping Bag. 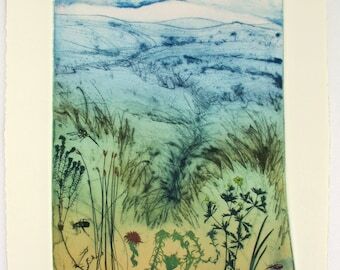 Full colour drypoint and photo etching of Dartmoor landscape near Okehampton, Devon. Limited edition. 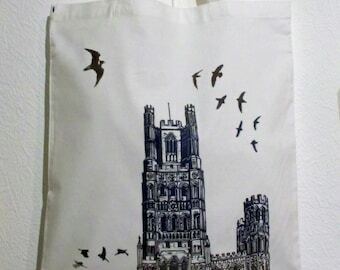 Ely Cathedral and birds Hand printed tote bag. Screenprinted bag with long handles. Reusable market Bag. Cranmere Pool, Dartmoor Devon. Landscape art of Devon wildlife. Drypoint with photo etching. 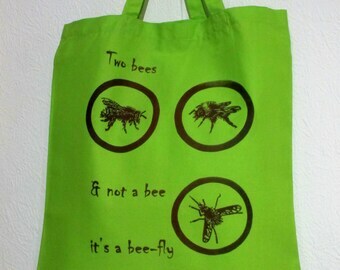 Cotton tote bag with honey bee, bumble bee and a bee fly. Hand screenprinted green tote bag with short handles. Reusable Book Bag. Midnight Bue Silk Aquatint. Greater Horseshoe bat at night. 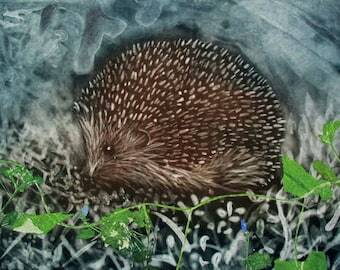 Hedgehog artwork. 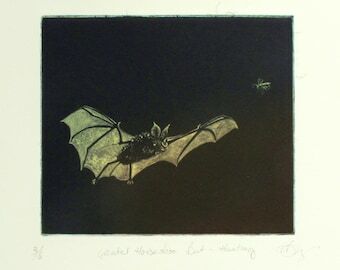 Silk aquatint or silk mezzotint. 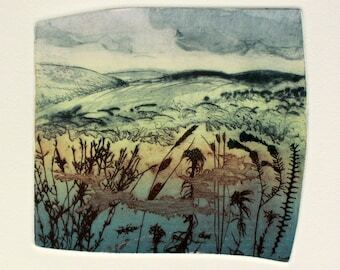 Full colour intaglio monoprint. Green cotton bag with adorable headgehogs. 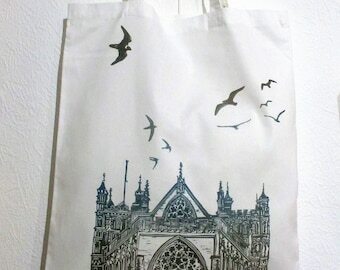 Hand printed tote bag. Screenprinted bag with short handles. Reusable Shopping Bag. 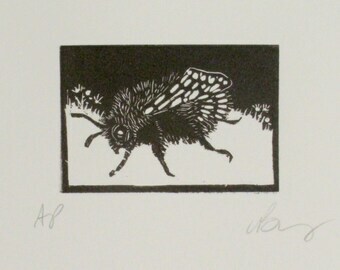 Bee Wood engraving. Hand pulled print. Fine art. Dartmoor Magnificent Mires. 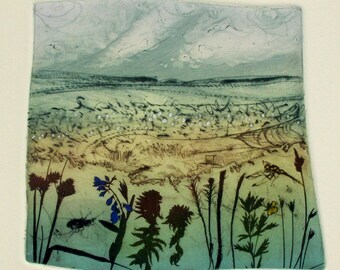 Botanical print and wildlife of blanket bogs. Wonderful art. Very good communication and lovely packaging. Very professional. This is an exceptional wood engraving and I am so proud to add it to my small wood cut collection. 'Looking forward to checking out your shop from time to time. This piece and one other arrived securely packaged, making for an overall very positive Etsy purchasing experience. Many thanks! Hand printed wood engraving. Laid Hedge in colour. This am absolutely in love with this incredible engraving. It and its "mate" arrived nicely package and more than met my expectations. I look forward to finding a suitable matte and frame. 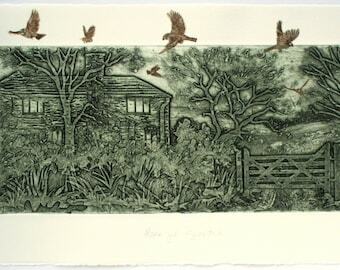 Wood engraving of Laid Hedge. Wood block print. Drypoint on aluminium. OOAK. Block printed chine colle tissue. Reeds. 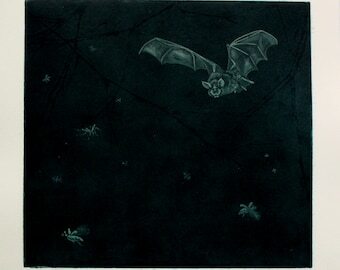 Pipistrelle bat Drypoint. Cute little bat. 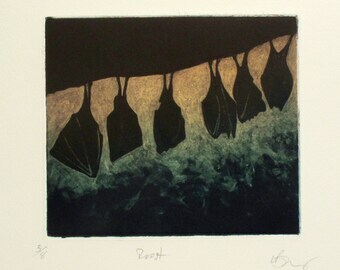 Hand printed Artist Proof. Three little rare bees off on their way to Switzerland. But don't worry, three more rare bees now listed to replace them. Photographing some more little prints this morning to replace some of the small prints I've sold recently. Even with editions, I like to photograph the actual print listed. 2nd time in 24hrs I'm popping to the post office to send of a wee package. I always add a postcard & a discount code for repeat customers. This one contains a butterfly to send to Scotland, not dissimilar to the one in the link. My original training in the 1980s was in conservation of prints and drawings and gave a solid foundation in the traditional techniques of the ‘old masters’ and an appreciation of quality materials. As a young thing I even worked at the British Museum for a while. Although it was a thrill to handle genuine Rembrandt prints and I was good at “touching up old masters” – this wasn’t what I saw myself doing for the rest of my life. I needed to be doing something more creative. After a while working in animation and still feeling frustrated, I sent myself off to travel around Africa to get myself energized. The result being that I found it very hard to slip back into working for other people and had a burning desire to find out what I could do for myself artistically. To cut a long story short – I went back to college to study fine art and found myself gravitating towards printmaking again. 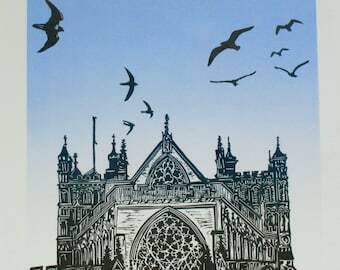 On graduating I was very fortunate to be in a position to set up a print workshop in Exeter with a colleague. Over the years Double Elephant Print Workshop has gone from strength to strength and there are now 7 voluntary directors, approximately 90 members, loads and loads of courses and a bank of portable presses that get taken to schools and community groups so that printmaking can reach more people. Now that Double Elephant is more established and I have excellent colleagues working with me, I have been able to put more of my energies into my own artwork. I have my own web site and I’m a member of the Devon Guild of Craftsmen (you are thoroughly vetted before you are allowed to join!). Although I do sell work in some local galleries and get work out in exhibitions further afield. I am seriously enjoying having a shop here on Etsy. I’m mainly listing small easy to post work and I’m greatly appreciating getting feedback from people all over the world! If you see anything on my website you would like a closer look at, I am very happy to list it here for you so that you can get multiple views and close ups. Of course, if you are relatively local, you can get in touch to arrange a studio visit. I hope you enjoy exploring my shop. If you have any questions about my work or about printmaking generally, I would be very happy for you to get in touch with me. 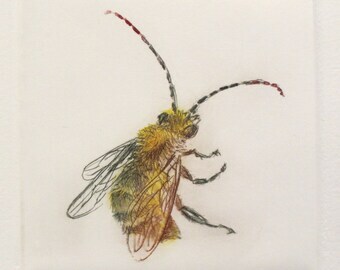 I am also admin for https://www.etsy.com/uk/shop/DoubleElephantPrints the Etsy shop for the print workshop I manage in Exeter. Originally trained in Conservation of Prints and Drawings 1980 -1982. Fine art BA University of Plymouth 1993 -1996. Co-founder of Double Elephant Print Workshop and workshop manager since 1997. Member of the Devon Guild of Craftsmen since 2007. Greetings!! – and welcome to my fine art print shop. Each print is a hand crafted original. There are no reproductions here. 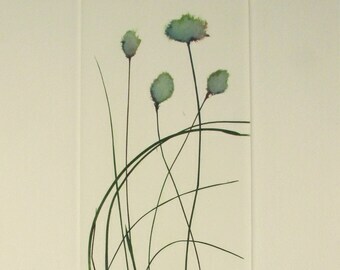 All of my work is inspired by nature, the environment and the tenacity of 'weeds'. I have some coupons made so that when you receive your first order you will also get a code to give you a discount on subsequent orders. Parcels will also contain an art postcard (or two) or other small gift!!! I like to use top quality heavy weight paper (usually 300gm) so It is best not to roll up prints for posting, especially when the printing process results in a fair amount of embossing. I will therefore only ship my prints flat and protected with card. If you do not find the answer to your questions below, please do not hesitate to contact me. I comply with UK Distance Selling Regulations. Please contact me by conversation through Etsy, or email me within 14 days from the day after you RECEIVE the goods. Please return the item to me as soon as you can so that I am able to refund your money (including the original shipping fee) within 30 days of the date of cancellation. PLEASE ensure that it is packaged and returned in the original condition. It is advised that you obtain a certificate of posting from the Post Office (or overseas equivalent) we don't want it getting lost on its way back to me. Bear in mind that the colour on your monitor may vary slightly to the colour of the print. I make sure each parcel is packaged carefully and clearly addressed with the address you choose during your Etsy checkout. Please get in touch with me and we will sort something our together. For example - if the item appears to be LOST we would need to chase up the post office and leave sufficient time before we can be sure that the item really is lost in the post before we agree to replace or refund. If the item arrives DAMAGED - if it is an editioned print, I may have an identical print to send as a replacement. If it is one of a kind, I may have something similar or you may choose to have a refund. Please inform me within 7 days from the day after you received the DAMAGED goods and I will arrange a refund or replacement within 30 days from being notified of the problem. If your print has been DAMAGED in the post I will need you to send the item back to me (or, at the very least, email a very clear photograph of the damage) so that I can be compensated by the post office myself. Statutory right are different in various countries. Please note that your statutory rights are not affected by the above shop policies in any way. I accept payment via PayPal, Direct checkout or Etsy Gift Cards, and will ship your items within a few days of your PayPal order being verified. It is not necessary to have a PayPal account to pay via PayPal. You can pay by credit or debit card without setting up a PayPal account. Follow the step by step instructions on the PayPal site. If you choose to CANCEL an order after payment please convo/email as soon as you have made that decision. That way we might be able to catch it before the item has gone in the post (I post within 3 days!). I will refund you as promptly as I can. According to the UK Distance Selling Regulations, you have 7 days from the day after you RECEIVE the goods to cancel your order, and I have 30 days from being notified of the cancellation to refund you. See Refund Policy below. Most orders are shipped within three days of the receipt of payment and sent to the address you choose during you Etsy checkout. I will send you confirmation that your item has been sent. Orders will be shipped standard first class. If the value of your purchase exceeds £40 I will post special delivery to include tracking and a higher compensation for loss or damage. I do this for my own security and peace of mind and so that I can more easily refund you in the event of the package being lost in the post. The shipping price quoted is approximately the price for standard Royal Mail Airmail. But in practice I choose to post special delivery to include tracking and a higher compensation for loss or damage. I do this for my own security and peace of mind and so that I can more easily refund you in the event of the package being lost in the post. Please note - I am in the UK and SHIPPING OVERSEAS CAN TAKE TIME TO ARRIVE & EXACT TIME CANNOT BE PREDICTED. International customers are responsible for all fees, taxes and duties associated with shipping to their respective countries. If your purchase is a gift for someone and you would like it posted directly to them let me know. I can also include a message from you, simply email me the message and I can print it out and include it in the package. If your item gets damaged or lost in the post, please get in touch with me and we will sort something our together. See Refund Policy below. Please leave feedback to let me know you have received and are happy with your order. And please feel free to contact me if you have any questions regarding any of my prints you see. I’m very happy to explain my printing processes and tell you all about the source inspiration. And the really keen might like to visit my website – there are larger and more expensive pieces of artwork there than I’m listing in my Etsy shop. Can studio visits be arranged? Studio visits by appointment or during open studio events only. Can workshop visits be arranged? When not working in my studio, I create my prints at Double Elephant Print Workshop - where I also teach. Visitors welcome on Wednesdays 10am-4pm.